Ships tomorrow if ordered in the next 1 day, 14 hours and 59 minutes! TRC's world famous colloidal minerals with 70 essential minerals and trace minerals are now available in vegetable capsules! Ideal to take when you are away from home! TRC's world famous colloidal minerals are now available in vegetable capsules! 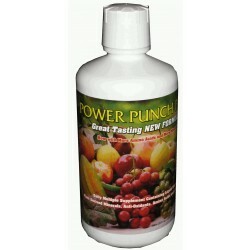 Each capsule contains 600 milligrams of approximately 70 minerals in their concentrated powdered form. 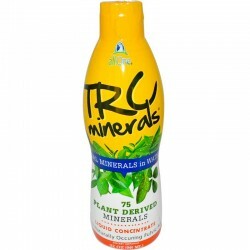 One serve has the same essential minerals as one serve of TRC's Liquid Colloidal Minerals. In a convenient small tub, this is the ideal mineral supplement to carry with you when you are away from home! TRC has developed a method to slowly remove the water base from Liquid Colloidal Minerals by low temperature evaporation. All of the moisture is removed by a high volume of warm air which never exceeds 100 degrees F. This low temperature maintains the integrity and enzymatic activity of the water soluble plant derived minerals. 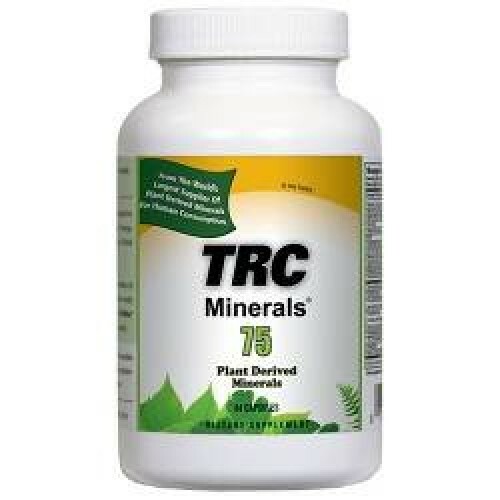 TRC Mineral Supplements support and catalyse enzyme function, protein digestion, metabolism, and the billions of cellular electrolyte impulses and chemical reactions in our body. So many foods today are depleted of minerals, containing no more than 15-20 minerals. As a result, people are becoming increasingly mineral deficient. Dr Linus Pauling, two time Nobel Laureate, once said "Every sickness, every disease, and every ailment can be traced to a mineral deficiency !" This is why a good spectrum or ionic minerals and trace minerals is absolutely essential to maintain good nutrition health. The Rockland Mine in Emery, Utah USA, provides the world's purest and most concentrated source of plant derived minerals, known as Senonian Compost. This accumulation of more than 600 years of prehistoric plants grew approximately 70 million years ago during the Senonian Period. Only pure, cold water is used to extract an average of 75 Colloidal Minerals from the compost. Science has proven that metallic rock minerals are difficult to digest. By contrast, plant derived minerals have been broken down by the plant and are much more easily assimilated by the body, much like mothers' milk is to an infant. Each capsule in packed with antioxidants and contains a natural assortment of colloidal minerals in their unaltered form. These minerals are leached from a prehistoric plant material known as humic shale which comes from TRC Minerals Inc. in Emery, Utah. The humic shale is placed in large food grade vats and submerged in cool, contaminant-free water where it is allowed to leach naturally and undisturbed. During this period, the water soluble plant minerals blend with the water to form the concentrate known as TRC Minerals. Minerals initiate, regulate and control every organ and function in our bodies. Minerals are the catalysts that keep the spark of life going. Don't be fooled by companies that are misleading consumers by selling them Sea Salts and Silver products that are metallic minerals. Get The Best Life Has To Offer - Try TRC 75 Colloidal Minerals today! Minerals are the catalysts that keep the spark of life going! The ideal mineral supplement to carry with you when you are away from home!